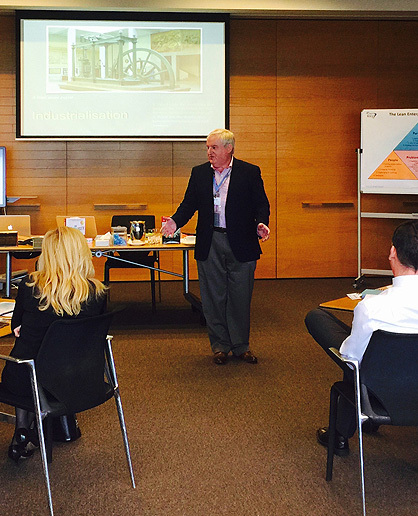 Barry is a recent graduate of the Toyota Production System, but will always be a student. Experiencing the rhythmic production lines of Australia, Thailand, Indonesia, Kentucky, and of course Japan at its heart, has been meaningful work. Barry specialises in the implementation of integrated systems and routines; always respecting human resource development. He has implemented company-wide: Hoshin Kanri, Toyota Business Practices, On-job-development, Leadership Development, and the Toyota Way. At the shop floor level: Management, Engineering, and Logistics Development Systems, Jishuken, Standardised work, A3, and PDCA. He worked in the Toyota Institute, Manufacturing Organisational Planning and Development, and the TPS office within Toyota. With a grounded engineering background Barry has also implemented continuous improvement in food processing, manufacturing, packaging, printing, and front of house food service and management. In addition to the practical experience Barry has completed a Master degree in Applied Positive Psychology, Graduate Diploma in Business, Diploma of Training and Assessment, Diploma in Competitive Systems and Practices. Interestingly Barry’s first degree was civil engineering and is a chapter president of AME in Australia.